MASKerade: OLW 142 Happy Birthday To ME! OLW 142 Happy Birthday To ME! And it's my turn to host One Layer Wednesday. This week's challenge is an inspiration challenge - make a card that you think I would like (in my style or involving my interests). I'll give you some hints, and you can take a look around my blog - you can case one of my cards if you like, but it must have only one layer. My interests are varied and eclectic. I love my family (most of the time, lol! ), music, especially playing the piano, flowers, David Bowie, Christmas, James Bond movies, Diana Gabaldon novels, Dr Suess' poetry, Pierce Brosnan, Robert Downey Jr, chocolate, autumn, spa treatments, jewellery, numbers and mathematics, baking, cardmaking and blogging, crossword puzzles (cryptic) and word games. As for design, you know I love cheerful bright colours (especially aquas and rainbows) and clean design with lots of white space. Oh, yeah, and SPARKLE! My card is a little busier than usual because it's hard to fit 46 candles on a 4.25x 5.5 piece of paper! My card is a simple grid design, (I literally drew a grid on it, so that my candles would be fairly evenly spaced). I coloured the little candles (Kim Hughes before she was Paper Smooches) with copics and added Stickles for shine. 2. Create a card that you think I would like - it can be inspired by my interests above or one of my previous cards. It does not have to be a birthday card. Remember to keep embellishments to a minimum and NO ADDITIONAL LAYERS of cardstock. 3. Post your card online and link it to the InLinkz button to the right. If you link to your blog, please link to the specific post, not your blog’s main page. ETA - if you are already tired of CASing my cards for the blog-birthday-party hosted by Darnell today (thank you so much - what a lovely surprise! ), please feel free to link up any one layer birthday card! ohoooo... happy birthday to a great designer! I wish you a fabulous day with lot of sun! Happy Birthday Ardyth!!! wishing you a fabulous day...love your cards and all those candle, so festive. Happy birthday, Ardyth! It was fun getting to know you a little bit more in this post : ) I love that I don't even have to count the candles, I absolutely know you planned for the right number to be there!! Happy, Happy Birthday to my fave Muse. I would definitely post a birthday card....I've CASED most of yours......but I can't figure out how to please Splitcoast Stampers size limit since I got new (used) camera and an Apple computer that doesn't do anything like my old computer. When I get it figured out I'll post. Meantime I hope you have fun all week. Hope you are having /had a fabulous day!! Love love love all your cards!!! Oh, the precision ;) Love those dinky candles! Happy birthday, Ardyth, hope you have a wonderful day! Happy birthday Ardyth. Hope you have a wonderful day! Happy, happy birthday to you Ardyth! I hope you have an absolutely wonderful day! Love your cheery 46 candles! I'm really loving those tiny candles all lined up so perfectly. Wow! 23 birthday wishes before 6:40am! I will assume many of your followers are in (very) different time zones (or they are crafting through night!). Happy Birthday my sister! Enjoy the day! My word game friend, I will challenge you to a game of Bananagrams next time you're in town...the topic?...all things Robert Downey Jr. You in? Have a wonderful birthday Ardyth! Happy Birthday Ardyth..............have a wonderful day!!! Happy Birthday Ardyth. Have a fabulous time, hope you family are treating you like a princess as you deserve it. Happy birthday to you!!! I do hope that you have a wonderful day. I love, love this card - it is so perfectly you! The rainbow colours, the repeated design and, of course, that touch of sparkle. ENJOY YOUR DAY!! Happy Birthday again! Happy Birthday! I can't believe you got 46 candles on this card and they're all straight. I'd have to go with an artsy look since I don't do straight well. Even with a grid! Happy Birthday! Wishing you a wonderful day ... a great celebration. Bravo for getting the exact number of candles on your card. Love getting to know you better and I'll be playing in this fun challenge. Happy happy birthday, Ardyth!! 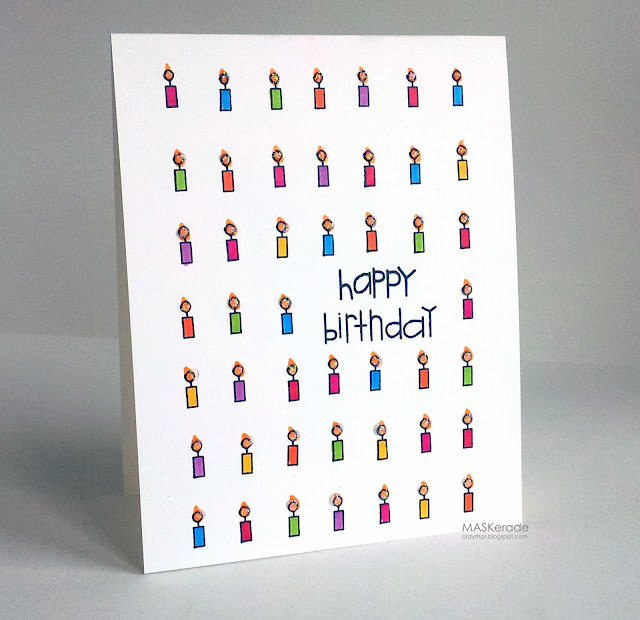 Loving this card and all those little candles and the way that the flames actually look dimensional. Awesome! Hope you have a wonderful day! Wish you a very happy birthday Ardyth!! Have a fantastic day. I just LOVE your card! Happy 46th Birthday, Ardy!! I love your card you made yourself! I see two of our other friends have linked their birthday cards from your party over at my place, so I am doing the same since it is a OLC. Great minds, again!! HaHaHa! Can you tell I was up until 1 AM? My card is NOT one-layer and I shall delete it immediately! I'm punchy now, I'm laughing so hard, I'm crying. If I can't delete, please do it for me!!! Oofta. Happy birthday to one of my favorite stampers ever!! I made a card for you and it is over at my blog or the link to it is on Darnell's blog. Happy, Happy Birthday. I love your work! So creative and bright. Always! Many happy returns Ardyth. Hope you g=have a wonderful day. Happy birthday to you, happy birthday to you, happy birthday, dear Ardyth. Happy birthday to you. And many more!!!! Now, aren't you glad you didn't have to hear me sing that? Yep, that is my gift to you. Big hugs and no, we're not tired of CASing your cards!!! Happy, Happy, Happy Birthday to you, Ardyth!!! I hope you have a wonderful day with family and friends, and that all of your wishes come true! I also wish you a year filled with good health and happiness!!! As always, I LOVE your card! In fact, even though I don't usually play along with OLW, I'm going to create a card this week...thanks for the encouragement! Happy, happy, happy, happy BIRTHDAY!! I will have to linky later on tonight with a card! Yay! I really admire your creativity, I love how you take a few supplies and turn them into a stunning CAS card. You are very inspirational! Also, Thank you for your comment on my horse card and for your past comments, I really appreciate them. Happy Birthday one terrific designer! Enjoy your day! Happy Birthday, Ardeth. Hope you have had a great day. Happy Birthday, Ardyth. I'm glad Darnell is leaving the link open because I'd like to add my "Ardyth" card. I love all the little candles, and no, I didn't count them. Happy Birthday! You deserve all the cards and wishes you're getting...and then some. Wishing you a very Happy b'day Ardyth! How fun to get all those cards!! Happy Happy Birthday Ardyth! I don't think that anyone could get sick of CASEing your amazing cards, and this one is just another example of that, it's wonderful! Wow, I'm obviously a little behind on my reading. Happy belated birthday! Hope it was a good one. I will see if I can come up with something this weeknd for this challenge. Belated happy birthday Ardyth - I will definitely be CASEing this card at some point - love it!